Just after the completion of Class 12th examination most of students get confused about which path they move in so as to reach at their goal. Every individual wishes for a degree, successful job and good earning but all these you will get if only you choose right path according to your liability. Take decision with care before going for any one option. After 10th there are three streams given to all students to choose from that is, Science, Commerce, Arts /Humanities. In this article we are focusing on the students who are pursuing commerce at 10+2 level. Commerce is a vast field having many courses of bachelor level. Commerce deals with accounts, financial assistance, and mathematics like subjects. Commerce is the most common branch opted by lakhs of students all over the nation. It also deals with Business, Legal Finance, Economic Legal, Banking, technological and political particulars. There are large numbers of major industries where commerce graduates can find their jobs like Banking, Accounts, Insurance, Management, Investments and many others. You can also become a part of the corporate world in the post of analyst, executive, banker, Sr. executive or manager. There are a lots of job opportunities waiting in the field of commerce. 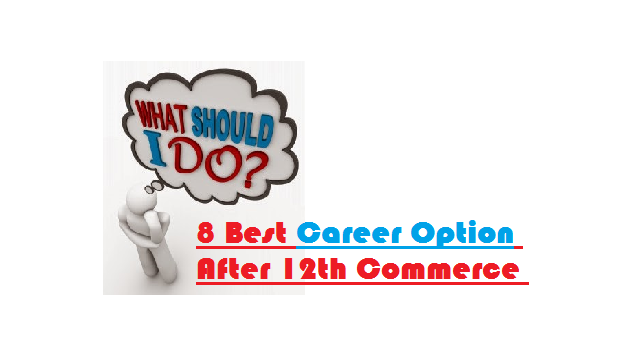 There are number of options to choose after 12th commerce but 8 best career options after 12th are given below as per the specialization of your degree from any reputed universities. If you are students of commerce without Math then you can still go for various career options. Below mentioned are some of the options which one can go through with which doesn’t require math as one of the compulsory subject. Many organizations private and public have demands of financial managers, treasurers, controller, credit manager and other financial staff for financial taxation reports and other requirements. The employment in commerce fields are money making. The doors are open in both private and public organizations for commerce graduates. They can also work in companies as Manager, Auditors, Specialist, Consultant, Management Executive, Account Executive, Junior Accountant, CA, Book Keeper, Entrepreneur etc. Commerce students have also demand in bank and stick market areas such as bank deposits, mutual funds, stock markets, venture capital, insurance schemes and portfolio management. Teaching may also be one of the options you can pursue after higher studies. There are large numbers of graduation courses available for students from Commerce field. We tried our best to list down the top degree courses one can go through with for higher studies. We advise candidates don’t choose any field in excitement or in hurry. Take some time, do research and then choose one field according to your compatibility. Career is something that you can’t shift every year or after 3-4 years. So decide wisely and put your best.